I live in Belgium, Europe and always dreamed to ride along Route 66. Three years ago I decided to do it with a 100% green vehicle. allowing to save 30 pounds (15 kg). During those 3 years I get excited each time I flew out to Orlando. It was thrilled to improve the calculations and plans I initially did at home. who might want to join me on the road for a few miles (or more). I’m Michel a 53 years old Belgian broadcasting engineer. In October 2017, I will attempt to make my dream come true: cover not less than 2448 miles in 60 days using only solar energy. I invented and built this solar bike piece by piece, which resulted in the first electric bike sourced by solar panels to reach a speed of 20 miles per hour. I will leave the Orlando area on October 2017, where I have built this bike, to head straight for Chicago where his amazing challenge will start. 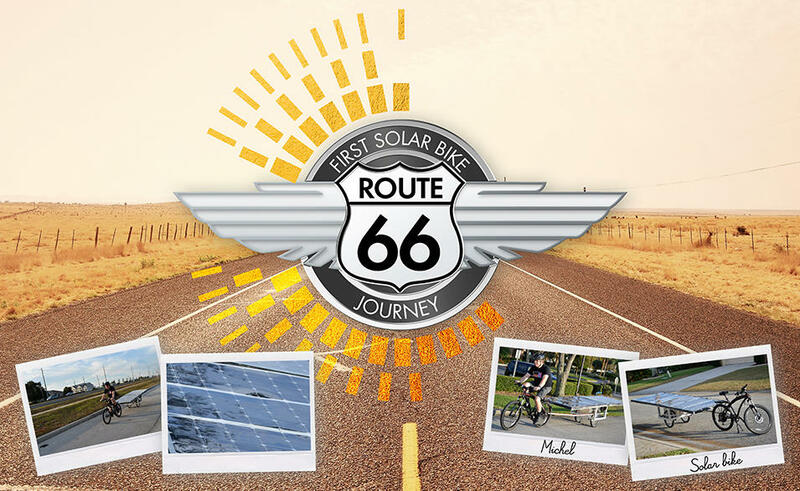 In Chicago i will join Route 66 and will attempt a global record: riding all along Route 66 on a solar bike, ending in Santa Monica and headlining green energy as the sustainable new way in serving our daily needs. If you have sun you can find a way to make it run!